Schadenfreude is the story of a teenage Jewish intellectual who falls in love-in love with a boy (who breaks her heart), a language (that's nearly impossible to master), a culture (that's nihilistic, but punctual), and a landscape (that's breathtaking when there's not a wall in the way). Rebecca is an everyday, misunderstood nineties teenager with a passion for Pearl Jam and Ethan Hawke circa Reality Bites, until two men walk into her high school Civics class: Dylan Gellner, with deep brown eyes and an even deeper soul, and Franz Kafka, hitching a ride in Dylan's backpack. These two men are the axe to the frozen sea that is Rebecca's spirit, and what flows forth is a passion for all things German. 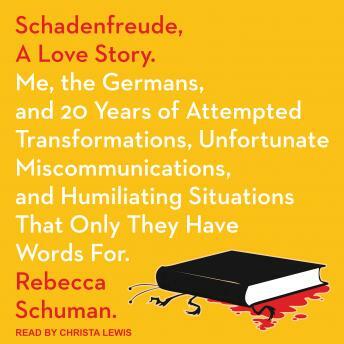 First love might be fleeting, but Kafka is forever, and in pursuit of this elusive passion Rebecca will spend two decades stuttering and stumbling through German sentences, trying to win over a people who can't be bothered.